Cable the network as shown in the topology. Create multiple role views and grant varying privileges. Lock down a router using AutoSecure and verify the configuration. Use the SDM Security Audit tool to identify vulnerabilities and lock down services. Contrast the AutoSecure configuration with SDM. The router is a key component that controls the movement of data into and out of the network and between devices within the network. It is particularly important to protect the network routers because the failure of one of these devices due to malicious activity could make sections of the network or the entire network inaccessible. Controlling access to routers and enabling reporting on routers are critical to network security and should be part of a comprehensive security policy. In this lab, you build a multi-router network and configure the routers and hosts. You use various CLI and SDM tools to secure local and remote access to the routers, analyze potential vulnerabilities, and take steps to mitigate them. You also enable management reporting to monitor router configuration changes. The router commands and output in this lab are from Cisco 1841s using Cisco IOS software, release 12.4(20)T (advanced IP image). Other routers and Cisco IOS versions can be used. See the Router Interface Summary table at the end of the lab to determine which interface identifiers to use based on the equipment in the lab. Depending on the model of the router, the commands available and output produced may vary from what is shown in this lab. This lab is divided into five parts. Each part can be administered individually or in combination with others as time permits. The main goal is to configure various Cisco IOS and SDM security features on routers R1 and R3. R1 and R3 are on separate networks and communicate through R2, which simulates a connection to an ISP. Students can work in teams of two for router security configuration, one student configuring R1 and the other student configuring R3. The basic running configs for all three routers are captured after Parts 1 and 2 of the lab are completed. The running config commands that are added in Parts 3 and 4 are captured and listed separately. The running configs generated by AutoSecure for R3 and SDM Security Audit for R1 in Part 5 of the lab are listed separately. All configs are found at the end of the lab. In Part 1 of this lab, you set up the network topology and configure basic settings such as interface IP addresses and static routing. Step 1: Cable the network. b. Configure interface IP addresses as shown in the IP Addressing Table. c. Configure a clock rate for routers with a DCE serial cable attached to their serial interface. Router R1 is shown here as an example. d. To prevent the router from attempting to translate incorrectly entered commands as though they were host names, disable DNS lookup. Router R1 is shown here as an example. Configure a static IP address, subnet mask, and default gateway for PC-A and PC-C as shown in the IP Addressing Table. Yes.If the pings are not successful, troubleshoot the basic device configurations before continuing. Were the ping results successful? Yes. If the pings are not successful, troubleshoot the basic device configurations before continuing. Note: If you can ping from PC-A to PC-C you have demonstrated that static routing is configured and functioning correctly. If you cannot ping but the device interfaces are up and IP addresses are correct, use the show run and show ip route commands to help identify routing protocol related problems. Configure an SSH server on router R1 using the CLI. Research terminal emulation client software and configure the SSH client. Note: Perform all tasks, on both R1 and R3. The procedures and output for R1 are shown here. Step 1: Configure a minimum password length for all router passwords. Use the security passwords command to set a minimum password length of 10 characters. Step 2: Configure the enable secret password. Configure the enable secret encrypted password on both routers. How does configuring an enable secret password help protect a router from being compromised by an attack? The goal is to always prevent unauthorized users from accessing a device using Telnet, SSH, or via the console. If attackers are able to penetrate this first layer of defense, using an enable secret password prevents them from being able to alter the configuration of the device. Unless the enable secret password is known, a user cannot go into privileged EXEC mode where they can display the running config and enter various configuration commands to make changes to the router. This provides an additional layer of security. Step 3: Configure basic console, auxiliary port, and virtual access lines. a. Configure a console password and enable login for routers. For additional security, the exectimeout command causes the line to log out after 5 minutes of inactivity. The logging synchronous command prevents console messages from interrupting command entry. Note: To avoid repetitive logins during this lab, the exec-timeout command can be set to 0 0, which prevents it from expiring. However, this is not considered a good security practice. When you configured the password for the console line, what message was displayed? b. Configure a new password of ciscoconpass for the console. d. Telnet from R2 to R1. Were you able to login? Why or why not? No. No password has been set on the vty lines. e. Configure the password on the vty lines for router R1. f. Telnet from R2 to R1 again. Were you able to login this time? Yes. A password has been set. g. Enter privileged EXEC mode and issue the show run command. Can you read the enable secret password? Why or why not? No, the enable secret password is encrypted automatically using the MD5 hash algorithm. Can you read the console, aux, and vty passwords? Why or why not? Yes, they are all in clear text. h. Repeat the configuration portion of steps 3a through 3g on router R3. Step 4: Encrypt clear text passwords. c. At what level (number) is the enable secret password encrypted? d. At what level (number) are the other passwords encrypted? e. Which level of encryption is harder to crack and why? 5, because the algorithm is stronger than 7. Step 1: Configure a warning message to display prior to login. a. Configure a warning to unauthorized users with a message-of-the-day (MOTD) banner using the banner motd command. When a user connects to one of the routers, the MOTD banner appears before the login prompt. In this example, the dollar sign ($) is used to start and end the message. b. Issue the show run command. What does the $ convert to in the output? The $ is converted to ^C when the running-config is displayed. c. Exit privileged EXEC mode using the disable or exit command and press Enter to get started. Does the MOTD banner look like what you created with the banner motd command? Note: If the MOTD banner is not as you wanted it, recreate it using the banner motd command. Task 3. Configure Enhanced Username Password Security on Routers R1 and R3. Step 1: Investigate the options for the username command. Step 2: Create a new user account using the username command. a. Create the user01 account, specifying the password with no encryption. b. Use the show run command to display the running configuration and check the password that is enabled. You still cannot read the password for the new user account. Even though unencrypted (0) was specified because the service password-encryption command is in effect. Step 3: Create a new user account with a secret password. a. Create a new user account with MD5 hashing to encrypt the password. b. Exit global configuration mode and save your configuration. c. Display the running configuration. Which hashing method is used for the password? MD5, because the secret password was configured. Step 4: Test the new account by logging in to the console. a. Set the console line to use the locally defined login accounts. What is the difference between logging in at the console now and previously? You are prompted to enter a Username as well as a password. d. After logging in, issue the show run command. Were you able to issue the command? Why or why not? e. Enter privileged EXEC mode using the enable command. Were you prompted for a password? Why or why not? Step 5: Test the new account by logging in from a Telnet session. Were you prompted for a user account? Why or why not? No, the vty lines were not set to use the locally defined accounts as the line 0 console was. b. Set the vty lines to use the locally defined login accounts. c. From PC-A, telnet to R1 again. Yes, the vty lines are now set to use the locally defined accounts. d. Log in as user01 with a password of user01pass. e. While telnetted to R1, access privileged EXEC mode with the enable command. What password did you use? f. For added security, set the AUX port to use the locally defined login accounts. g. End the Telnet session with the exit command. Step 1: Configure the router to watch for login attacks. Use the login block-for command to help prevent brute-force login attempts from a virtual connection, such as Telnet, SSH, or HTTP. This can help slow down dictionary attacks and help protect the router from a possible DoS attack. a. From the user EXEC or privileged EXEC prompt, issue the show login command to see the current router login attack settings. b. Use the login block-for command to configure a 60 second login shutdown (quiet mode timer) if two failed login attempts are made within 30 seconds. c. Exit global configuration mode and issue the show login command. Is the router enabled to watch for login attacks? Yes What is the default login delay? 1 second between successive attempts. R1#<b>show login</b> A default login delay of 1 second is applied. No Quiet-Mode access list has been configured. Router enabled to watch for login Attacks. If more than 2 login failures occur in 30 seconds or less, logins will be disabled for 60 seconds. Router presently in Normal-Mode. Current Watch Window Time remaining: 29 seconds. Login failures for current window: 0. Total login failures: 0. A default login delay of 1 second is applied. logins will be disabled for 60 seconds. Step 2: Configure the router to log login activity. a. Configure the router to generate system logging messages for both successful and failed login attempts. The following commands log every successful login and log failed login attempts after every second failed login. b. Issue the show login command. What additional information is displayed? All successful logins are logged. Step 3: Test the enhanced login security login configuration. b. Attempt to log in with the wrong user ID or password two times. What message was displayed on PCA after the second failed attempt? What message was displayed on the router R1 console after the second failed login attempt? c. From PC-A, attempt to establish another Telnet session to R1 within 60 seconds. What message was displayed on PC-A after the attempted Telnet connection? What message was displayed on router R1 after the attempted Telnet connection? d. Issue the show login command within 60 seconds. What additional information is displayed? QuietMode status. Router is currently denying logins from all sources. R1#<b>show login</b> A default login delay of 1 seconds is applied. No Quiet-Mode access list has been configured. Router enabled to watch for login Attacks. If more than 2 login failures occur in 30 seconds or less, logins will be disabled for 60 seconds. Router presently in Quiet-Mode. Will remain in Quiet-Mode for 34 seconds. Denying logins from all sources. Will remain in Quiet-Mode for 34 seconds. Denying logins from all sources. authentication of the remote computer. SSH is rapidly replacing Telnet as the remote login tool of choice for network professionals. Note: For a router to support SSH, it must be configured with local authentication, (AAA services, or username) or password authentication. In this task, you configure an SSH username and local authentication. b. Exit to the initial router login screen, and log in with this username. What was the router prompt after you entered the password? The privileged EXEC (enable) prompt # sign. With a privilege level of 15, the login defaults to privileged EXEC mode. Specify a privilege level of 15 so that a user with the highest privilege level (15) will default to privileged EXEC mode when accessing the vty lines. Other users will default to user EXEC mode. Use the local user accounts for mandatory login and validation, and accept only SSH connections. Note: The login local command should already be configured in a previous step. It is included here to provide all commands if you were doing this for the first time. Note: If you add the keyword telnet to the transport input command, users can log in using Telnet as well as SSH, however, the router will be less secure. If only SSH is specified, the connecting host must have an SSH client installed. Step 4: Erase existing key pairs on the router. Note: If no keys exist, you might receive this message: % No Signature RSA Keys found in configuration. Step 5: Generate the RSA encryption key pair for the router. The router uses the RSA key pair for authentication and encryption of transmitted SSH data. Configure the RSA keys with 1024 for the number of modulus bits. The default is 512, and the range is from 360 to 2048. Note: The details of encryption methods are covered in Chapter 7. Step 6: Verify the SSH configuration. Step 7: Configure SSH timeouts and authentication parameters. Step 8: Save the running-config to the startup-config. Step 1: Research terminal emulation client software. Conduct a web search for freeware terminal emulation client software, such as TeraTerm or PuTTy. What are some capabilities of each? TeraTerm: This Telnet client provides VT100 emulation, selected VT200/300 emulation, TEK4010 emulation and Kermit, XMODEM, ZMODEM, B-PLUS, and Quick-VAN file transfer protocols. It also offers the ability to connect to SSH2 hosts, a built-in Web server for HTTP pass-through commands, and macro language abilities, including ODBC support, recurring commands, and directory-independent operation. PuTTy: This application uses both SSH and regular Telnet connections. It runs as an executable application without needing to be installed onto your system. Step 2: Install an SSH client on PC-A and PC-C.
b. Save the application to the desktop. Step 3: Verify SSH connectivity to R1 from PC-A. b. Input the R1 Fa0/1 IP address 192.168.1.1 in the Host Name or IP address field. c. Verify that the SSH radio button is selected. g. At the R1 privileged EXEC prompt, enter the show users command. What users are connected to router R1 at this time? h. Close the PuTTY SSH session window. i. Try to open a Telnet session to your router from PC-A. Were you able to open the Telnet session? Why or why not? No, the Telnet session fails because only SSH is enabled for the vty lines. j. Open a PuTTY SSH session to the router from PC-A. Enter the user01 username and password user01pass in the PuTTY window to try connecting for user who does not have privilege level of 15. Were you able to login? Yes What was the prompt? Because user01 was not created with a privilege level of 15 (the default is level 1), the prompt is user EXEC (>). l. Disable the generation of system logging messages for successful login attempts. Create multiple administrative roles or views on routers R1 and R3. Grant each view varying privileges. Verify and contrast the views. The role-based CLI access feature allows the network administrator to define views, which are a set of operational commands and configuration capabilities that provide selective or partial access to Cisco IOS EXEC and configuration (config) mode commands. Views restrict user access to the Cisco IOS CLI and configuration information. A view can define which commands are accepted and what configuration information is visible. Note: Perform all tasks on both R1 and R3. The procedures and output for R1 are shown here. If an administrator wants to configure another view to the system, the system must be in root view. When a system is in root view, the user has the same access privileges as a user who has level-15 privileges, but the root view user can also configure a new view and add or remove commands from the view. When you are in a CLI view, you have access only to the commands that have been added to that view by the root view user. Step 1: Enable AAA on router R1. To define views, AAA must be enabled. Note: AAA is covered in Chapter 3. Step 2: Enable the root view. Use the command enable view to enable the root view. Use the enable secret password cisco12345. If the router does not have an enable secret password, create one now . R1# <b>enable view</b> Password: <b>cisco12345</b> *Dec 16 22:41:17.483: %PARSER-6-VIEW_SWITCH: successfully set to view 'root'. Step 1: Create the admin1 view, establish a password, and assign privileges. a. The admin1 user is the top-level user below root that is allowed to access this router. It has the most authority. The admin1 user can use all show, config, and debug commands. Use the following command to create the admin1 view while in the root view. Note: To delete a view, use the command no parser view viewname. b. Associate the admin1 view with an encrypted password. c. Review the commands that can be configured in the admin1 view. Use the commands ? command The following is a partial listing of the available commands. d. Add all config, show, and debug commands to the admin1 view and then exit from view configuration mode. e. Verify the admin1 view. f. Examine the commands available in the admin1 view. g. Examine the show commands available in the admin1 view. Step 2: Create the admin2 view, establish a password, and assign privileges. not allowed to configure the routers or use debug commands. a. Use the enable view command to enable the root view, and enter the enable secret password cisco12345. b. Use the following command to create the admin2 view. c. Associate the admin2 view with a password. d. Add all show commands to the view and then exit from view configuration mode. e. Verify the admin2 view. f. Examine the commands available in the admin2 view. Step 3: Create the tech view, establish a password, and assign privileges. a. The Tech user typically installs end-user devices and cabling. Tech users are only allowed to use selected show commands. b. Use the enable view command to enable the root view, and enter the enable secret password cisco12345. c. Use the following command to create the tech view. *Dec 16 23:10:27.587: %PARSER-6-VIEW_CREATED: view 'tech’ successfully created. d. Associate the tech view with a password. e. Add the following show commands to the view and then exit from view configuration mode. f. Verify the tech view. g. Examine the commands available in the tech view. h. Examine the show commands available in the tech view. i. Issue the show ip interface brief command. Were you able to do it as the tech user? Why or why not? Yes, it is one of the allowed commands. j. Issue the show ip route command. Were you able to do it as the tech user? No, it is not one of the allowed commands. R1#<b>show ip route</b> ^ % Invalid input detected at '^' marker. k. Return to root view with the enable view command. l. Issue the show run command to see the views you created. For tech view, why are the show and show ip commands listed as well as show ip interface and show ip interface brief? All parts of the command must be listed for the more specific parameters to work. Step 4: Save the configuration on routers R1 and R3. Configure the logging trap level on a router. Note: Perform all tasks on both R1 and R3. The procedure and output for R1 is shown here. The Cisco IOS Resilient Configuration feature enables a router to secure the running image and maintain a working copy of the configuration so that those files can withstand malicious attempts to erase the contents of persistent storage (NVRAM and flash). The feature secures the smallest working set of files to preserve persistent storage space. No extra space is required to secure the primary Cisco IOS image file. In this task, you configure the Cisco IOS Resilient Configuration feature. Step 1: Display the files in flash memory for R1. Step 2: Secure the Cisco IOS image and archive a copy of the running configuration. a. The secure boot-image command enables Cisco IOS image resilience, which hides the file from dir and show commands. The file cannot be viewed, copied, modified, or removed using EXEC mode commands. (It can be viewed in ROMMON mode.) When turned on for the first time, the running image is secured. securely archives it in persistent storage (flash). Step 3: Verify that your image and configuration are secured. a. You can use only the show secure bootset command to display the archived filename. Display the status of configuration resilience and the primary bootset filename. b. What is the name of the archived running config file and on what is the name based? runcfg- 20081217-254218.ar. It is based on the date and time archived by the secure boot-config command. Step 4: Display the files in flash memory for R1. a. Display the contents of flash using the show flash command. b. Is the Cisco IOS image or the archived running config file listed? No, they are hidden. c. How can you tell that the Cisco IOS image is still there? The bytes available and bytes used are approximately the same as before (minus the space taken by the archived running config file). Step 5: Disable the IOS Resilient Configuration feature. a. Disable the Resilient Configuration feature for the Cisco IOS image. b. Disable the Resilient Configuration feature for the running config file. Step 6: Verify that the Cisco IOS image is now visible in flash. Step 7: Save the configuration on both routers. Router R2 will be the master NTP clock source for routers R1 and R3. Note: R2 could also be the master clock source for switches S1 and S3, but it is not necessary to configure them for this lab. indirectly. For this reason, you must first ensure that R2 has the correct Coordinated Universal Time set. Note: If you are using SDM to configure R2 to support NTP, skip this step and go to Step 2.
a. Display the current time set on the router using the show clock command. b. To set the time on the router, use the clock set time command. R2#<b>clock set 20:12:00 Dec 17 2008</b> R2# *Dec 17 20:12:18.000: %SYS-6-CLOCKUPDATE: System clock has been updated from 01:20:26 UTC Mon Dec 15 2008 to 20:12:00 UTC Wed Dec 17 2008, configured from console by admin on console. configured from console by admin on console. c. Configure R2 as the NTP master using the ntp master stratum-number command in global configuration mode. The stratum number indicates the distance from the original source. For this lab, use a stratum number of 3 on R2. When a device learns the time from an NTP source, its stratum number becomes one greater than the stratum number of its source. Step 2: Configure R1 and R3 as NTP clients using the CLI. a. R1 and R3 will become NTP clients of R2. To configure R1, use the global configuration command ntp server hostname. The host name can also be an IP address. The command ntp updatecalendar periodically updates the calendar with the NTP time. take some time for the NTP association to form. c. Issue the debug ntp all command to see NTP activity on R1 as it synchronizes with R2. R1#<b>debug ntp all</b> NTP events debugging is on NTP core messages debugging is on NTP clock adjustments debugging is on NTP reference clocks debugging is on NTP packets debugging is on Dec 17 20.12:18.554: NTP message sent to 10.1.1.2, from interface 'Serial0/0/0' (10.1.1.1). Dec 17 20.12:18.574: NTP message received from 10.1.1.2 on interface 'Serial0/0/0' (10.1.1.1). Dec 17 20:12:18.574: NTP Core(DEBUG): ntp_receive: message received Dec 17 20:12:18.574: NTP Core(DEBUG): ntp_receive: peer is 0x645A3120, next action is 1. Dec 17 20:12:18.574: NTP Core(DEBUG): receive: packet given to process_packet Dec 17 20:12:18.578: NTP Core(INFO): system event 'event_peer/strat_chg' (0x04) status 'sync_alarm, sync_ntp, 5 events, event_clock_reset' (0xC655) Dec 17 20:12:18.578: NTP Core(INFO): synchronized to 10.1.1.2, stratum 3 Dec 17 20:12:18.578: NTP Core(INFO): system event 'event_sync_chg' (0x03) status 'leap_none, sync_ntp, 6 events, event_peer/strat_chg' (0x664) Dec 17 20:12:18.578: NTP Core(NOTICE): Clock is synchronized. Dec 17 20:12:18.578: NTP Core(INFO): system event 'event_peer/strat_chg' (0x04) status 'leap_none, sync_ntp, 7 events, event_sync_chg' (0x673) Dec 17 20:12:23.554: NTP: Calendar updated. Dec 17 20:12:18.578: NTP Core(NOTICE): Clock is synchronized. Dec 17 20:12:23.554: NTP: Calendar updated. d. Issue the undebug all or the no debug ntp all command to turn off debugging. e. Verify the time on R1 after it has made an association with R2. Step 3: (Optional) Configure R1 and R3 as NTP clients using SDM. You can also use SDM to configure the router to support NTP. If you configured R1 as an NTP client using Cisco IOS commands in Step 2, you can skip this step, but read through it to become familiar with the process. If you configured R1 and R3 as NTP clients using Cisco IOS commands in Step 2 you can still perform this step but you need to issue the following commands first on each router. a. From the CLI, enable the http server on R1. b. Open a browser window on PC-A and start SDM by entering the R1 IP address 192.168.1.1 in the address field. Log in as admin with password cisco12345. c. To configure SDM to allow you to preview the commands before sending them to the router, select Edit > Preferences. d. In the User Preferences window, select Preview commands before delivering to router and click OK.
e. To configure an NTP server, click the Configure button and select Additional Tasks > Router Properties > NTP/SNTP. Click Add. f. In the NTP Server IP Address field, enter the IP address of the R2 master NTP router (10.1.1.2) and click OK.
g. In the Deliver Configuration to Router window, make sure that the Save running config to router’s startup config check box is checked and click Deliver. h. Click OK in the Commands Delivery Status window. i. Open a console connection to the router, and verify the associations and time on R1 after it has made an association with R2. It might take some time for the NTP association to form. Step 1: Install the syslog server. Note: This lab uses the Kiwi syslog server. Step 2: Configure R1 to log messages to the syslog server using the CLI. a. Verify that you have connectivity between R1 and the host by pinging the R1 Fa0/1 interface IP address 192.168.1.1. If it is not successful, troubleshoot as necessary before continuing. b. NTP was configured in Task 2 to synchronize the time on the network. Displaying the correct time and date in syslog messages is vital when using syslog to monitor a network. If the correct time and date of a message is not known, it can be difficult to determine what network event caused the message. Verify that the timestamp service for logging is enabled on the router using the show run command. Use the following command if the timestamp service is not enabled. c. Configure the syslog service on the router to send syslog messages to the syslog server. Step 3: Configure the logging severity level on R1. Logging traps can be set to support the logging function. A trap is a threshold that when reached triggers a log message. The level of logging messages can be adjusted to allow the administrator to determine what kinds of messages are sent to the syslog server. Routers support different levels of logging. The eight levels range from 0 (emergencies), indicating that the system is unstable, to 7 (debugging), which sends messages that include router information. Note: The default level for syslog is 6, informational logging. The default for console and monitor logging is 7, debugging. a. Use the logging trap command to determine the options for the command and the various trap levels available. b. Define the level of severity for messages sent to the syslog server. To configure the severity levels, use either the keyword or the severity level number (0–7). Note: The severity level includes the level specified and anything with a lower severity number. If you set the level to 4 or use the keyword warnings, you capture messages with severity level 4, 3, 2, 1, and 0.
c. Use the logging trap command to set the severity level for R1. d. What is the problem with setting the level of severity too high or too low? Setting it too high (lowest level number) could generate logs that missed some very useful but not critical messages. Setting it too low (highest level number) could generate a large number of messages and fill up the logs with unnecessary information. e. If the command logging trap critical were issued, which severity levels of messages would be logged? Emergencies, alerts, and critical messages. Step 4: Display the current status of logging for R1. a. Use the show logging command to see the type and level of logging enabled. Step 5: (Optional) Configure R1 to log messages to the syslog server using SDM. a. Open a browser on PC-A, and start SDM by entering the R1 IP address 192.168.1.1 in the address field. Log in as admin with password cisco12345. b. Select Configure > Additional Tasks > Router Properties > Logging, and double-click Syslog. c. In the Logging window, click Add and enter the IP address of the syslog server, PC-A (192.168.1.3). Click OK.
d. From the Logging Level drop-down menu, select the logging level of Warnings (4). e. Deselect Logging Buffer, and then click OK.
f. Click Yes in the SDM Warning dialog box. g. In the Deliver Configuration to Router window, click Deliver. Click OK in the Commands Delivery Status window. h. Click Save on the toolbar. Click Yes in the SDM Write to Startup Config Warning window. Step 6: Start the Kiwi Syslog Server. Kiwi Enterprises > Kiwi Syslog Daemon. Step 7: Verify that logging to the syslog server is occurring. On the syslog server host PC-A, observe messages as they are sent from R1 to the syslog server. a. Send a test log message to the kiwi syslog server by choosing File > Send test message to local host. b. Generate a logging message by shutting down the Serial0/0/0 interface on R1 or R2 and then reenabling it. The Kiwi syslog screen should look similar to the one below. c. What would happen if you were shut down the Fa0/1 interface on R1 (do not actually perform this action)? This is the connection from the router to the Syslog server and will result in no log messages being received. d. From the R1 global configuration mode, enable the logging of user info when enabling privileged mode and reset the trap level to informational. e. On the Kiwi Syslog Daemon, click View > Clear Display to clear the log display. Note: You can enable the desired view from the user EXEC prompt. This allows different users to login without having to know the privileged EXEC mode enable secret password. g. Exit to the login screen again, and enable the admin1 view. This time enter the password incorrectly. What message was displayed on the syslog server? Restore routers R1 and R3 to their basic configuration. Use AutoSecure to secure R3. Use the SDM Security Audit tool on router R1 to identify security risks. Fix security problems on R1 using the Security Audit tool. Review router security configurations with SDM and the CLI. To avoid confusion as to what was already entered and what AutoSecure provides for the router configuration, start by restoring router R3 to its basic configuration. a. Connect to the R3 console and login as admin. b. Enter privileged EXEC mode. c. Erase the startup config and then reload the router. a. When the router restarts, restore the basic configuration for R3 that was created and saved in Part 1 of this lab. b. Issue the show run command to view the current running configuration. Are there any security related commands? A few unused interfaces are shutdown by default, and ip http server and ip http secure-server are disabled. c. Test connectivity by pinging from host PC-A on the R1 LAN to PC-C on the R3 LAN. If the pings are not successful, troubleshoot the router and PC configurations until they are. By using a single command in CLI mode, the AutoSecure feature allows you to disable common IP services that can be exploited for network attacks and enable IP services and features that can aid in the defense of a network when under attack. AutoSecure simplifies the security configuration of a router and hardens the router configuration. Step 1: Use the AutoSecure Cisco IOS feature. b. Issue the auto secure command on R3 to lock down the router. Router R2 represents an ISP router, so assume that R3 S0/0/1 is connected to the Internet when prompted by the AutoSecure questions. Respond to the AutoSecure questions as shown in the following output. The responses are bolded. Step 2: Establish an SSH connection from PC-C to R3. a. Start PuTTy or another SSH client, and log in with the admin account and password cisco12345 created when AutoSecure was run. Enter the IP address of the R3 Fa0/1 interface 192.168.3.1.
b. Because AutoSecure configured SSH on R3, you will receive a PuTTY security warning. Click Yes to connect anyway. c. Enter privileged EXEC mode, and verify the R3 configuration using the show run command. d. Issue the show flash command. Is there a file that might be related to AutoSecure, and if so what is its name and when was it created? Yes, the filename is pre_autosec.cfg. It is a backup file that was created when AutoSecure ran. e. Issue the command more flash:pre_autosec.cfg. What are the contents of this file, and what is its purpose? This file is a saved file that contains the R3 configuration before AutoSecure ran. f. How would you restore this file if AutoSecure did not produce the desired results? Copy this file from flash to startup-config using the command copy flash:pre_autosec.cfg start and issue the reload command to restart the router. Step 3: Contrast the AutoSecure-generated configuration of R3 with the manual configuration of R1. a. What security-related configuration changes were performed on R3 by AutoSecure that were not performed in previous sections of the lab on R1? Answers will vary but could include: AutoSecure enables AAA and creates a named authentication list (local_auth). Console, AUX, and vty logins are set up for local authentication. The security authentication failure rate 10 log command was added. The tcp intercept feature was enabled, ip http server was disabled, cdp was disabled, security passwords min-length was changed from 8 to 6. Logging trap debugging was enabled. Other minor but potentially exploitable services were disabled. An enable password was created. Logging buffered and logging console critical were enabled. b. What security-related configuration changes were performed in previous sections of the lab that were not performed by AutoSecure? Answers will vary but could include: Telnet access was excluded from vty transport input. Additional accounts were created. c. Identify at least five unneeded services that were locked down by AutoSecure and at least three security measures applied to each interface. Ping from PC-A on the R1 LAN to PC-C on the router R3 LAN. Were the pings successful? Yes If pings from PC-A to PC-C are not successful, troubleshoot before continuing. To avoid confusion as to what was previously configured and what SDM Security Audit tool provides for the router configuration, start by restoring router R1 to its basic configuration. a. Connect to the R1 console and log in as admin. Step 2: Restore the basic config. a. When the router restarts, cut and paste the basic startup config for R1 that was created and saved in Part 1 of this lab. b. Test connectivity by pinging from host PC-A to R1. If the pings are not successful, troubleshoot the router and PC configurations to verify connectivity before continuing. c. Save the running config to the startup config using the copy run start command. In this task, you use the SDM graphical user interface to analyze security vulnerabilities on router R1. SDM is faster than typing each command and gives you more control than the AutoSecure feature. Step 1: Verify whether SDM is installed on router R1. Note: SDM can be run from the PC or the router. If SDM is not installed on your router, check to see if it is installed on the PC. Otherwise, consult your instructor for directions. Step 2: Create an SDM user and enable the HTTP secure server on R1. a. Create a privilege-level 15 username and password on R1. b. Enable the HTTP secure server on R1. *Dec 19 17:01:08.731: %PKI-4-NOAUTOSAVE: Configuration was modified. c. Enable local HTTP authentication on R1. d. Save the running config to the startup config. a. From PC-A, run the SDM application and enter the IP address of R1 FA0/1 (192.168.1.1) or open a web browser and navigate to https://192.168.1.1. b. Note: Make sure that you have all pop-up blockers turned off in your browser. Also make sure tha Java is installed and updated. c. When the certification error message is displayed, click Continue to this web site. d. Log in with the previously configured username and password. e. At the Warning Security messages, click Yes. f. At the Password Needed – Networking message, enter the username and password again. Step 4. Back up the current router configuration. a. Back up the router configuration from within SDM by choosing File > Save Running Config to PC. b. Save the configuration on the desktop using the default name of SDMConfig.txt. Step 5. Begin the security audit. a. Select Configure > Security Audit. b. Click the Perform Security Audit button to start the Security Audit wizard, which analyzes potential vulnerabilities. This helps you become familiar with the types of vulnerabilities that Security Audit can identify. You will be given an opportunity to fix all or selected security problems after the audit finishes.. Note: The Security Audit tool also provides a One-Step Lockdown option that performs a function similar to AutoSecure but does not prompt the user for input. c. After you have familiarized yourself with the wizard instructions, click Next. d. On the Security Audit Interface Configuration window, indicate which of the interfaces that are shown are inside (trusted) and which are outside (untrusted). For interface Fa0/1, select Inside (trusted). For interface S0/0/0, select Outside (untrusted). e. Click Next to check security configurations. You can watch the security audit progress. Step 6: Identify Security Audit unneeded services and recommended configurations. a. Scroll through the Security Audit results screen. What are some of the major vulnerabilities listed as Not Passed? Answers will vary but could include: Disable CDP, enable password encryption service, set banner, enable logging, set enable secret password, enable Telnet settings, enable SSH, and enable AAA. b. After reviewing the Security Audit report, click Save Report. Save it to the desktop using the default name SDMSecurityAuditReportCard.html. c. Open the report card HTML document you saved on the desktop to view the contents and then close it. 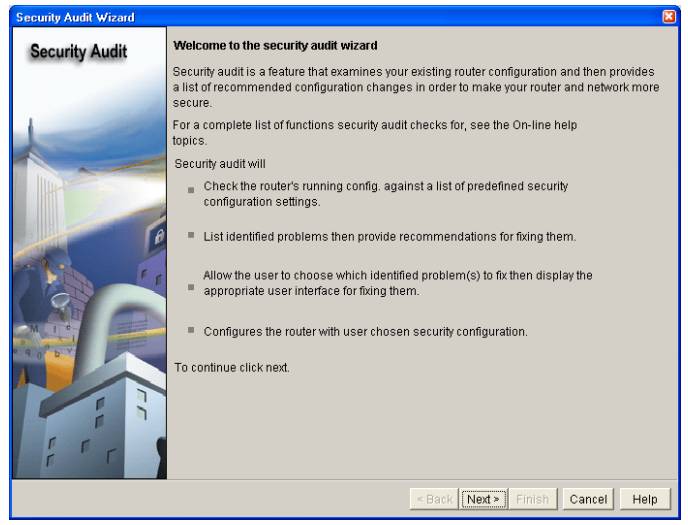 In this task, you will use the Security Audit wizard to make the necessary changes to the router configuration. Step 1: Review the Security Problems Identified window for potential items to fix. a. In the Security Audit window, click Close. b. A window appears listing the items that did not pass the security audit. Click Next without choosing any items. What message did you get? Warning. Please select at least one item to fix. c. Click OK to remove the message. Step 2: Fix security problems. With the Security Audit tool, you can fix selected problems or all security problems identified. a. Click Fix All and then click Next to fix all security problems. b. When prompted, enter an enable secret password of cisco12345 and confirm it. c. Enter the text for the login banner: Unauthorized Access Prohibited. Click Next. d. Add the logging host IP address 192.168.1.3, and accept the logging defaults. Click Next. e. Accept the default security settings for inside and outside interfaces and click Next. f. Deselect URL Filter Server, and click Next. g. For the security level, select Low Security and click Next. h. At the Firewall Configuration Summary, review the configuration and click Finish. i. Scroll through the Summary screen. This screen shows what Security Audit will configure for the router. j. Click Finish to see the actual commands that are delivered to the router. Scroll to review the commands. k. Make sure that Save running config to router’s startup config is selected, and click Deliver. l. Click OK in the Commands Delivery Status window to exit the Security Audit tool. How many commands were delivered to the router? 181 in this case. In this task, you will use Cisco SDM to review changes made by Security Audit on router R1 and compare them to those made by AutoSecure on R3. Step 1: View the running configs for R1 and R3. a. From the PC-A SDM session with R1, click the View option from the main menu and select Running Config. b. Using PuTTY, open an SSH connection to router R3, and log in as admin. c. Enter privileged EXEC mode, and issue the show run command. Step 2: Contrast AutoSecure with SDM Security Audit. a. Compare the function and ease of use between AutoSecure and SDM Security Audit. What are some similarities and differences? AutoSecure is an automated Cisco IOS-based CLI security tool that provides a one-step process that enables security features and disables unneeded services. AutoSecure allows a router to quickly be secured without thorough knowledge of all the Cisco IOS features. SDM Security Audit is a GUI-based tool that can perform a security analysis and fix all or selected problems. It also has a one-step lockdown feature. It provides wizards and is somewhat easier to use than AutoSecure. It also provides many helpful explanations as to how and what is being done. Although SDM Security Audit is GUI-based tool, the end result is a set of generated Cisco IOS commands that are delivered to the router. b. Refer to the AutoSecure configuration on R3 and the SDM Security Audit configuration on R1. What are some similarities and differences between the configurations generated by AutoSecure and Security Audit? Differences can vary depending on user responses to the prompts as each tool runs. Student answers may vary but could include: SDM generates a firewall with ACLs. AutoSecure disables more services. SDM generates more HTTP-related commands because it is web based. AutoSecure configures an enable password and an enable secret. SDM only configures the enable secret. AutoSecure does not prompt for a syslog host but SDM does. SDM firewall prompts for an HTTP filter. They both encrypt passwords, set login banners, set minimum password lengths, and control no ip redirects, ip unreachables, and ip proxy-arp for interfaces. Both enable AAA. why not? Yes, AutoSecure did not set up a firewall on R3. Note: Firewalls are covered in detail in Chapter 4.
b. Ping from PC-A on the R1 LAN to PC-C on the router R3 LAN. Were the pings successful? Why or why not? Yes, the R1 firewall allows traffic that originates from hosts on the R1 LAN to return. c. Ping from router R3 to the router R2 S0/0/0 interface (10.1.1.2). Were the pings successful? Why or why not? Yes. There is no firewall or security blocking pings on R2. d. Ping from router R3 to the router R1 S0/0/0 interface (10.1.1.1). Were the pings successful? Why or why not? No. The SDM Security Audit configuration does not allow R1 S0/0/0 to respond. e. Ping from PC-C on the R3 LAN to PC-A on the router R1 LAN. Were the pings successful? Why or why not? No, the SDM Security Audit configuration does not allow hosts on the R1 LAN to respond to requests from outside the firewall. a. How important is securing router access and monitoring network devices to ensure responsibility and accountability and for thwarting potentially malicious activity. Answers will vary but it should be clear after this lab that there are many potential vulnerabilities for routers that can be exploited. Securing these devices is a very important part of a network administrator’s job and an organization’s security policy. b. What advantages does SSH have over Telnet? SSH is much more secure than Telnet. c. What advantages does Telnet have over SSH? d. How scalable is setting up usernames and using the local database for authentication? Using the local router database for authentication does not scale well because usernames would need to be set up on each device. AAA with an external centralized server is a much more scalable solution. AAA is covered in detail in Chapter 3.
e. Why it is better to have centralized logging servers rather than only have the routers log locally? It is better to use centralized logging servers because it is much easier to manage and track events. In larger organizations, it is almost impossible to keep track of every individual router’s events without having a centralized way to view information. f. What are some advantages to using automated security mechanisms like AutoSecure and SDM Security Audit? These tools catch security vulnerabilities that many network administrators might overlook or might not even be aware of. These tools can lock down a router much faster than entering one command at a time and results in less potential for entry errors. Also, the tools avoid the need to use complex Cisco IOS commands and procedures. Note: To find out how the router is configured, look at the interfaces to identify the type of router and how many interfaces the router has. There is no way to effectively list all the combinations of configurations for each router class. This table includes identifiers for the possible combinations of Ethernet and Serial interfaces in the device. The table does not include any other type of interface, even though a specific router may contain one. An example of this might be an ISDN BRI interface. The string in parenthesis is the legal abbreviation that can be used in Cisco IOS commands to represent the interface. username user02 secret 5 $1$4dEG$m5EkFmKtgYERiQRgWwi5v. username admin privilege 15 secret 5 $1$uKGH$dq8qkvBLt5L4nED5bNTK4.